THIS (photo, above) is the existing border wall near Brownsville, Texas. A coyote with a torch can cut through one of the vertical supports in probably five minutes, allowing his clients to stroll right through to the promised land. President Trump didn’t get funding for a brick-and-mortar border wall in the spending deal with Democrats — but he got money to build a 20-foot high steel wall, the White House budget chief said Tuesday, according to The Washington Times. “That’s what we got in this deal and that’s what Democrats don’t want you to know,” Mick Mulvaney, director of the president’s budget office, said at the daily White House press briefing. 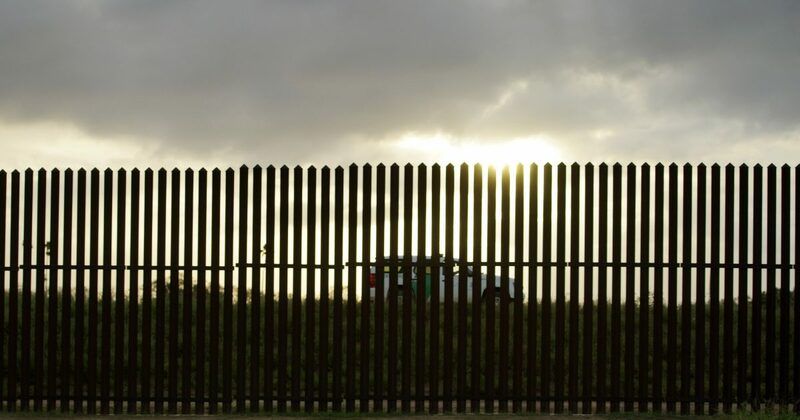 “There’s several hundred of millions of dollars for us to replace cyclone fencing with 20-foot high steel wall,” he said, pointing to a photograph of an existing stretch of the towering steel barrier along the southern border. “We are building this now,” he said. The administration has been aggressively pushing back against Capitol Hill Democrats’ claim of besting Mr. Trump in the spending negotiations, and blocking funds to build a border wall tops their list of victories. Mr. Mulvaney said Democrats glossed over the gains in the deal for Mr. Trump’s priority of cracking down on illegal immigration. The $1.5 billion increase in Homeland Security spending, pushing total spending for the department to more than $42 billion. “That’s where this negotiation has taken us — to the largest increase in border security in 10 years,” he said. The structure referenced by Mr. Mulvaney, which consists of rows of steel pylons capped with a concrete band, is the “fence” that been erected along the border in some place.